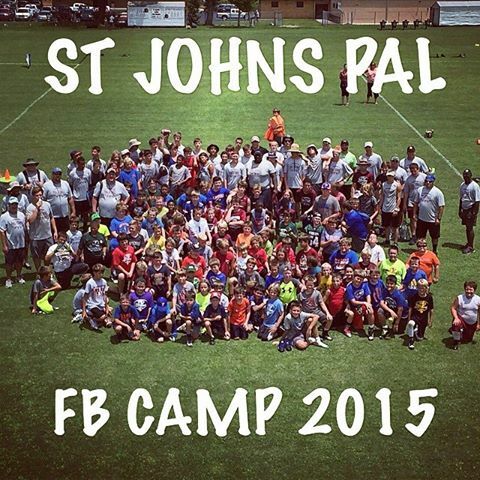 This week (July 27th – 30th) the St. Johns County Police Athletic League (PAL) held their annual Summer football camp for kids in grades ranging from 2nd grade through 8th grade. The camp is being attended by over 120 kids who will be participating in the Police Athletic Leagues Fall junior development league (JDL) and Middle School League football programs held in St. Augustine. Several former PAL football players and players from other associations who are now playing football at either St. Augustine High School, Pedro Menendez High School, or St. Joseph Academy were invited to volunteer to help coach at the four day camp. 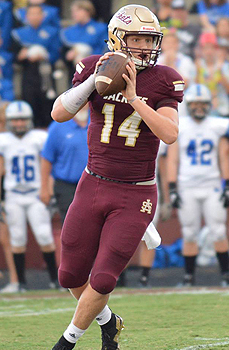 St. Augustine High School varsity quarterback Austin Reed joined in with several of his Jackets teammates to help coach several skills stations on offense and defense at the camp, and coach an 8th grade team for the week long flag football tournament held at the end of camp each day. Each of these volunteers earn 24 hours of volunteer service hours that are credited to their requirements at their respective schools. Great job guys!